Karim Ziadé, as part of his Bachelor’s summer project, examined the possibility of placing data centers into housing constructions for heating purposes. The server-heater can be considered to be a recent advancement in the field of smarthome products. These machines, as they stir through terabytes of data, are capable of releasing heat that is sufficient to control a comfortable temperature in a living room. 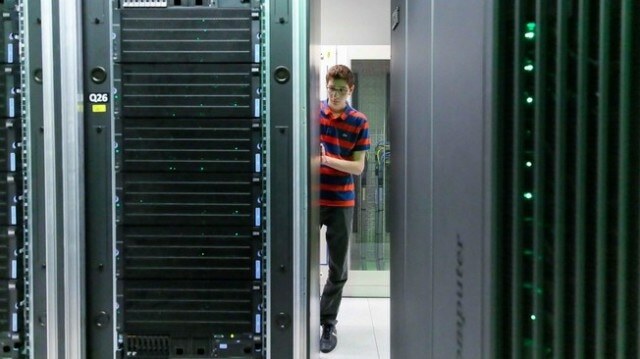 Data centers use almost 40% of electricity just for cooling the servers. Karim Ziadé, in his Bachelor’s project, focused on the possibility of using this heat for beneficial purposes by venturing into unexplored scientific territories. Talking about saving energy, it should be noted that Switzerland can actually stop the import of energy in winter under one of the analyzed situations. This approach will indeed require intense analysis based on economic terms. In Switzerland, data centers use 1.1 TWh, or 2% of the country’s total electricity consumption. The energy needed for hot water heaters and home heating amounts to around 5.7 TWh, 80% of which is taken up by imported energy in the winter. One logical solution that will help in good use of the heat is to place these data centers into residential areas spread all over the country. This indeed will also bring down the country’s foreign energy dependency. When compared to the heat released by data centers, the energy needed for heating is five times greater. Electricity consumption at data centers increases every five years and this highlights the fact that the tipping point should be reached within a period of 12 years. This motivated Ziadé to create two scenarios, which include the present and the future, when the consumption of electricity at data centers will go beyond the amount consumed for heating requirements. This is just a simplified preliminary estimate meant to determine whether or not this could be feasible in Switzerland. Rough estimations highlight that Switzerland can currently decrease its imports of electricity during winter by more than 10%. 100% energy independence can be obtained in the future scenario. This is a practical solution as far as energy capture is concerned. However, the economic study seems less convincing. Ziadé believes that servers used as heaters charge companies three times more than those utilized in the data centers. The installation charges will also go up as these servers will have to be replaced once in three years. Based on the existing scenario, the server-heater will prove to be valuable only if it operates for almost 4,000 hours per year. However, heating is needed only for nearly 2,000 hours per year (out of a grand total of 8,700 hours in a year). The estimations are also subject to a key variable, which refers to the price of electricity. Prices are indeed expected to increase and people will have to bring down their usage of electricity. The working cost of data centers is likely to see an increase corresponding to the acquisition price. Finally, Ziadé pointed out that the possibility of using server-heaters will need more intricate calculations that consider an increasing number of parameters.